Located only 20 minutes away from Ngurah Rai International Airport. 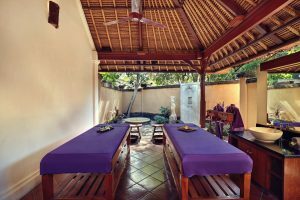 Mercure Resort Bali Sanur lies in the East of the city Denpasar – at the calm and relaxed environment of Sanur beach, where centuries of Balinese art and cultural history have been nurtured. Set right on one of Bali’s most beautiful, calm and white sand beaches, the resort exhibit authentic Balinese heritage and hospitality. Experience your stay at our iconic Balinese Cottages with Alang-Alang roofing and Lombok influenced architecture. Surrounded by 5 hectares of lush tropical gardens, providing you a sense of space and tranquility. Our attentive and friendly staffs are dedicated to your comfort, ensuring a memorable holiday that you will cherish for years to come. 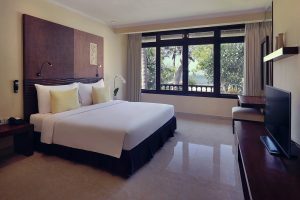 This getaway destination boasts one of the largest private beach front resorts in Sanur, a one stop destination in itself. At Mercure Resort Sanur, we provide you with the enjoyment of dining and drinking.